Three geochemical processes control the fact that CBM water contains substantially more bicarbonate and sodium than magnesium, calcium, and su microbial reduction of sulfate contributed by dissolving the mineral gypsum, or reduction of sulfate at depth, which may release bicarbonate; (2) removal of calcium and magnesium by ion exchange, which releases sodium, and by precipitation of calcite (CaCO3); and (3) enhanced dissolution of sulfide minerals and organic matter oxidation in water recharge areas, both of which generate acid. Brinck et al. (2008) schematically show how these processes generically occur along groundwater flow paths in the Powder River Basin (see figure below). The geochemical processes governing the evolution of sodium bicarbonate-dominated waters have been known for an extensive period of time because of the occurrence of such waters, absent methane, along the Atlantic and Gulf coastal plains (Foster, 1 950; Chapelle and Knobel, 1 983). In the case of the CBM water in the Powder River Basin, where coalbeds are relatively shallow in comparison to the other western CBM basins, much of the methane formed is related to geologically recent microbial processes. However, in basins where CBM is produced during lithification (the transformation of buried sediments to rock like material) of much deeper strata, the CBM is related to the thermogenic chemical, physical, or biological change experienced by the sediment and organic debris after its initial deposition and during and after the lithification processes that formed the coal. CBM produced waters of the San Juan, Raton, Piceance, and Uinta Basins also have a chloride signature which is not shown in the conceptual diagram of Brinck et al. (2008). See also Figure 2.9.
ratio (SAR; a numeric expression of the concentration of sodium, relative to the concentration of calcium and magnesium in produced water; see also Chapter 5 for discussion of issues related to TDS and sodium in CBM produced water). A comparison of representative principal salt constituent concentrations of water produced from major CBM basins in North America illustrates consistently elevated concentrations of sodium and bicarbonate and relatively (in most cases substantially) lower concentrations of calcium, magnesium, and sulfate (see Figure 2.9). Also evident are the substantially lower chloride and TDS concentrations in waters produced from the Powder River Basin, compared to waters from the other basins (see earlier sections of this chapter). The Powder River Basin contains primarily sodium bicarbonate-type formation water, whereas waters from the Piceance, Uinta, Raton, and San Juan basins contain sodium bicarbonate/chloride-type water. 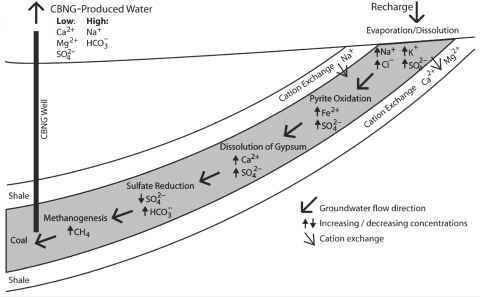 FIGURE Conceptual diagram of the geochemical evolution of CBM waters in the Powder River Basin shows biogeochemical processes that occur during the flow of groundwater from recharge areas downward through a coalbed to the point of extraction from a CBM well. Oxidation of the mineral pyrite, for example, may release iron and sulfate, while dissolution of the mineral gypsum may release calcium and sulfate. Reduction of sulfate at greater depths may result in release of bicarbonate. Methanogenesis results in the release of methane within the coal. SOURCE: Brinck et al. (2008). © 2008 by American Association of Petroleum Geologists. Reproduced by permission of AAPG whose permission is required for further use. NOTE: Both TDS and salinity can be used to measure water quality. TDS is a quantitative measure of all residual dissolved minerals after evaporation and is generally expressed as mg/L. Salinity measures the concentrations of dissolved salts in the water volume. Salinity may be measured by TDS, electrical conductivity, or osmotic pressure. Where sodium chloride and sodium bicarbonate are known to be the dominant minerals in a sample of water, such as in waters of the western basins, high TDS will often indicate high salinity. SOURCES: ALL Consulting (2003); S.S. Papadopulos & Associates (2007); water.usgs.gov/watuse/wu-glossary.html (accessed July 6, 2010); www.watereuse.org/information-resources/about-desalination/ glossaryd (accessed July 6, 2010); Wyoming DEQ (2005). Generally, TDS concentration ranges from the hundreds to thousands of milligrams per liter in produced water in the basins where sodium bicarbonate dominates, such as in the Powder River Basin, whereas TDS concentrations can exceed tens of thousands to more than 100,000 mg/L where sodium chloride dominates the chemistry of the CBM water, such as in the San Juan Basin (Table 2.2). In the Powder River Basin, much of the geochemical signature of the produced water is derived from water-rock interactions (Box 2.3). Jackson and Reddy (2007) report concentrations of trace elements and volatile organic compounds (Gas Research Institute, 1995; Rice et al., 2000) for produced water in the Powder River Basin (see also Jackson and Reddy, 2010). Some metals, such as barium, appear to have concentrations close to the solubility of controlling minerals (e.g., barite). 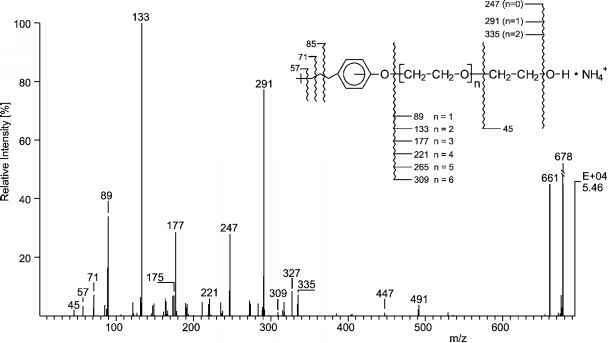 FIGURE 2.9 Predominant dissolved chemical constituents of typical CBM produced water from major methane-producing basins. Note the much higher concentrations of chloride associated with the San Juan, Raton—Colorado portion, Piceance, and Uinta Basins compared to the Powder River Basin. 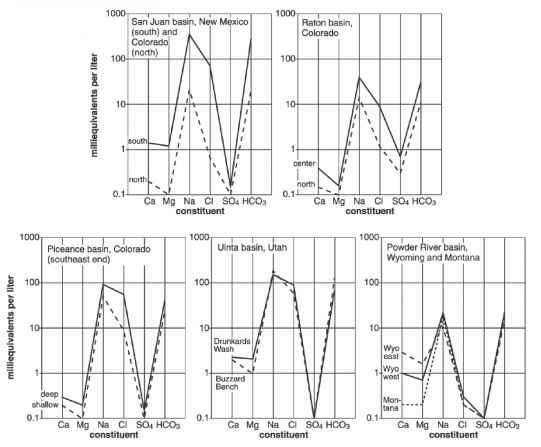 Note also the difference in concentrations in sodium and bicarbonate within the San Juan Basin where concentrations decrease from south (New Mexico) to north (Colorado). Data sets examined from the New Mexico portion of the Raton Basin indicated values similar to those in the Colorado portion (Haley, 2004). For ease of plotting the data, millequivalents per liter on the vertical axis normalizes milligrams per liter to both the number of atoms present per solute per liter and the valence, or charge, of the ions. SOURCE: Van Voast (2003). © 2003 by American Association of Petroleum Geologists. Reproduced by permission of AAPG whose permission is required for further use. NOTE: Milliequivalent is a unit of measure denoting one-thousandth of a molar equivalent of a substance. An "equivalent," in the case of Figure 2.9, refers to the amount of a substance (e.g., calcium) that supplies one mole of charge (positive or negative). Because calcium has a charge of +2, one mole of calcium provides two equivalents of charge. Therefore, a 1 milliequivalent/L solution of calcium is equal to a 0.5 millimole/L solution. For ions with a single charge, such as sodium and bicarbonate, one milliequivent/L is equal to one millimole/L. To convert millimole/L to mg/L, multiply by the molecular weight of the substance. Potentially toxic metals, such as arsenic, lead, and chromium, are generally found at concentrations less than most water quality standards in certain locations ( Jackson and Reddy, 2007; see Table 2.3). TABLE 2.3 Concentrations of trace elements (|ig/L) in CBM waters in outfalls and surface impoundments in the Powder River Basin: Little Powder, Powder, and Tongue River watersheds. NOTE: Outfalls refer to direct discharges of from water separated from individual methane wells. Disposal ponds are containment structures that store the discharge water from multiple outflows (see Chapter 4). Mean values (|ig/L) plus one standard deviation are shown for each constituent. SOURCE: Jackson and Reddy (2007). Figures converted from micromoles per liter in the original data source to micrograms per liter in this table. In contrast to the studies outlined above that examined inorganic carbon, trace concentrations of dissolved organic substances may also be present in some CBM produced waters, although these substances in CBM produced waters are neither well documented nor researched. Phenols, biphenyls, heterocyclic compounds, polycyclic aromatic hydrocarbons (PAHs), and other organic constituents have been measured in some produced waters, with PAHs being the most common organic substance detected or measured. Orem et al. (2007) report microgram per liter (|g/L) concentrations of organic compounds in CBM produced waters in the Powder River Basin, with PAH values up to 23 |g/L. The committee was unable to find other data regarding organic substances dissolved in CBM produced waters of the other western basins. Concern over management of CBM-produced water stems largely from two factors: water quantity and quality on local and regional watershed scales. Litigation during the past decade has been extensive, with plaintiffs registering concerns over numerous water quality and quantity issues and their effects (see also Chapters 3 and 5). Additionally, a number of research projects have involved either monitoring and data gathering or modeling in an attempt to define the extent of local or regional water resource responses to CBM produced water withdrawals and discharges. However, for the purposes of planning CBM produced water management, questions remain with regard to the effects of large-scale, localized, regional, and/or basin-wide withdrawals; deep-well reinjection; discharge for disposal through infiltration or evaporation; and release of treated or untreated CBM water to ephemeral and perennial streams. For purposes of evaluating these various management options on water quality and quantity (discussed in detail in Chapters 4 and 5), data to determine the connectivity of groundwater and surface water and groundwater modeling are necessary. The gaps and uncertainties related to connectivity and modeling conclude the discussion in this chapter. 9D. Baldwin, Colorado Oil and Gas Commission, personal communication, January 6, 2008.